To look for aliens, most people peer towards the sky. But if you look down, you'll discover they already live among us. These aliens have brains, like we do, but they're mostly inside their arms, and each arm acts as if it has a mind of its own. I'm speaking, of course, of the octopus. This tentacled beast – along with its cephalopod relatives, the squid and cuttlefish – are some of the strangest, most alien creatures on our planet. Scientists have a hard enough time getting into the minds of our nearest relatives, the apes and monkeys, let alone more distantly related mammals like dolphins or elephants. Octopuses? Forget about it. Our last common ancestor with the octopus was probably around 800 million years ago. So while we know they are capable of squeezing through holes the size of an inch, opening jars, and disguising themselves, there's a great deal that mystifies us about how and why the octopus could develop a brain unlike that of almost any other intelligent creature. Even the size of their brains is a matter of debate: estimates range from 100-500 million brain cells, depending on the species in question and who you ask. But everyone agrees that more than half of them are found within its eight arms. Humans, by contrast have some 85 billion neurons, most of which are inside our skulls. Each octopus arm contains some 40 million receptors, mostly along the rims of each sucker, which the octopus uses both for touch, as well as for detecting chemicals in a similar manner to our senses of taste and smell. Imagine what it would be like if the majority of your body were made of tongues, able to both touch and taste the entire world, and you might come a step closer to understanding life as an octopus. As well as that, octopus skin is also studded with pigment-containing chromatophores, which the octopus can control to change its appearance. Aristotle noticed this thousands of years ago, writing: "it seeks its prey by so changing its colour as to render it like the colour of the stones adjacent to it." Aristotle also wrote "the octopus is a stupid creature," so he was only half right. Each octopus arm acts as if it has a mind of its own, with its own intentions. Amputate one in a laboratory (octopuses can regenerate lost limbs, so this procedure is far less gruesome than it may seem), and it will continue to respond for an hour. It can crawl away, if it wants to. Or it can use its suckers to hold onto preferred objects, or to push repulsive ones away. And yet, despite eight independently operating arms, an octopus somehow manages not to tie itself into knots. How it manages to do this recently attracted the interest of Hebrew University neurobiologist Nir Nesher, and colleagues. They found that suckers automatically reject octopus arms, which explains how they avoid becoming a tangled mess. That said, octopuses sometimes eat each other, which means they don't always avoid octopus arms. How come? Nesher found that octopuses were able to distinguish their own amputated arms from arms that had been detached from other octopuses. So while it makes sense for octopus arms to avoid latching onto other octopus arms in general, it also makes sense for an octopus to sometimes ignore that rule, if it means enjoying a tasty meal. It also reveals at least a basic sort of self-recognition: octopus arms are okay to eat unless they're your own. Nesher also discovered that while their arms act independently, an octopus can override the simpler reflexes of its arms when it needs to. 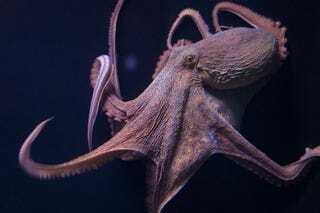 In that way, the octopus gets the best of both worlds: the arms can carry out most of their business on their own, leaving the animal to use higher-level decision-making processes only when necessary. It's an extremely efficient solution. In some ways, parts of the human nervous system work in a similar way. When we feel a painful sensation, like a sharp pinprick or a flame on our finger, we instinctively pull away. That reflex, which comes from the spinal cord, allows us to avoid danger even before our brains have registered the pain in the first place. But the kinds of decisions that octopus arms can make on their own, such as those involved in self recognition and in complex camouflage, appear to be more complex than simple pain avoidance. In addition to their arms' impressive sensory abilities, cephalopods have excellent vision, are capable of generating and storing both short-term and long-term memories, and can learn new tasks with ease. Some species even use tools. Wild octopuses have been repeatedly observed using rocks to block entrances to their dens, and some have been seen using empty coconut shells as temporary shelters. In aquariums, octopuses are known to play. Octopuses have basic personalities, showing individual differences in traits such as aggression or engagement. They can even learn how to solve problems by watching other octopuses, and they can remember the solutions, without practice, for several days. Sometimes they turn their considerable minds to human beings, forming opinions of who they do and don't like. It is unwise to get on the wrong side of an octopus: those grudges can last a surprisingly long time. Writer Sy Montgomery tells the tale of Truman, an aquarium octopus, in Orion Magazine: "Using his funnel, the siphon near the side of the head used to jet through the sea, Truman would shoot a soaking stream of salt water at this young woman whenever he got a chance. Later, she quit her volunteer position for college. But when she returned to visit several months later, Truman, who hadn't squirted anyone in the meanwhile, took one look at her and instantly soaked her again." All of that is particularly impressive considering these animals only live for a few years. Primates, dolphins, elephants, parrots, and all the rest of the so-called "smartest animals" can live for decades. It makes sense that evolution would have driven us to develop long-term memory skills, and the ability to form and retain reputations of other people, since an ability to remember our friends and enemies could be crucial for survival. But that's not true of cephalopods, who are not social (except when it comes to mating) and who live such brief lives. So how did this squishy sea-dwelling invertebrate evolve an intelligence that rivals the smartest among spined animals? Andrew Packard, a University of Edinburgh physiologist, thought that it was because the invertebrate cephalopods evolved in an environment in which they had to compete with fish for food, and in which they had to avoid being eaten by the same predators as the fish. Since the ancestors of fish and octopuses were eaten by the same predators, chief among them the ichthyosaurs ("the dolphins of Mesozoic seas," says Packard), in many ways they were subject to the same selection pressures. Fossil records reveal similar migration patterns among cephalopods and fish. They first emerged in relatively shallow, coastal waters, moved into more oceanic, deeper seas, and eventually came back to recolonise the coasts. If Packard is right, then the alien octopus's vertebrate-like intelligence was the result of having to survive in a world dominated by vertebrates. Our own ancestors' behaviour, in a way, unintentionally pushed cephalopods to create themselves in our own image. Or as Packard mused, "it is as if natural selection had favoured those that took the line, 'if you cannot beat them, join them.'" This post originally appeared on my BBC Future column, Uniquely Human. It has been reposted with permission.